Natural vs. fake tan: which is better for darkening skin? 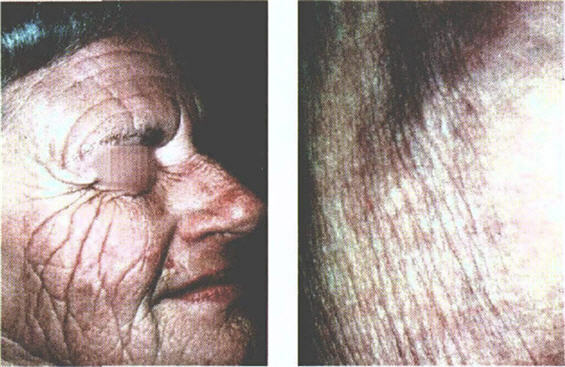 The image above contrasts photoaged skin (skin aged by sun exposure), at left, with intrinsic skin aging (e.g., aging of the skin of the armpits, which is exposed to very little sun). Intrinsic aging of the skin manifests in the form of fine wrinkles, thinning of the skin and loss of the fat deposits just below the skin. Sun-induced aging causes coarse wrinkles and furrowing, and also thickens the skin. The technical term for the process by which sun exposure ages skin is known as solar elastosis, which comprises of the accumulation of elastotic material in the skin. Elastosis is the process of loss of skin elasticity. Read more about intrinsic vs. extrinsic skin aging in an article by Jouni Uitto,(1, pdf) from which the image shown above is taken. So which is better for skin darkening/tanning, sun exposure or dihydroxyacetone (fake tan)? The picture speaks for itself. Uitto, J., The role of elastin and collagen in cutaneous aging: intrinsic aging versus photoexposure, J Drugs Dermatol, 7, s12 (2008). Avoiding the sun on face, ears, neck, maybe arms and hands is good advice especialy if you freckle ,it doesn't look good. Unless you get moles ect., there are health benefits to sun exposure between 10 and 2, mainly Vitamin D3 which may have important immune modulating effects and interactions with bodyfat. When sunbathing for health reasons it is wise to keep the previously areas covered. Restrict exposure to a maximum of 20 minutes a day (not every day), sun is said to have a tranquilizing effect so most people seriously overdo it. A disadvantage of blonde hair is that it doesn't frame the features by providing a contrast to to skin as well as dark hair, darkening the skin gets around this. Fake tan is definitely the way to go. If you have an intermediate shade of hair darkening the skin may result in a loss of contrast. Lightening the hair will provide a framing effect on the face. Dying the hair darker is another solution to this problem. Darkening the face by suntanning will of course roughen the skin especialy on the lips (lips don't produce melanin). The contrast between facial and lip pigmentation is important as a gender cue, it should pay to preserve it when applying fake tan (or bronzing make up). Lessening the contrast between facial pigmentation and eye/lip pigmentation may reduce the perceived femininity of a face. Europeans and Asians are invariably more attractive to me the paler they are. Meanwhile, when it comes to Africans, I'm attracted mostly to the darker-than-average. Go figure.